My attention has been on the other loom for a couple weeks, but I have managed to sneak in to the big loom and add a little bit to this monksbelt project. I would like to have more to show, but this is it. What a contrast between the fast plain weave baby wrap (see Quiet Friday: Woven Baby Wrap) and this very slow two-shuttle monksbelt. I enjoy weaving both. There’s a time for fast; and there’s a time for slow. White on white puts dramatic space between sections of color. 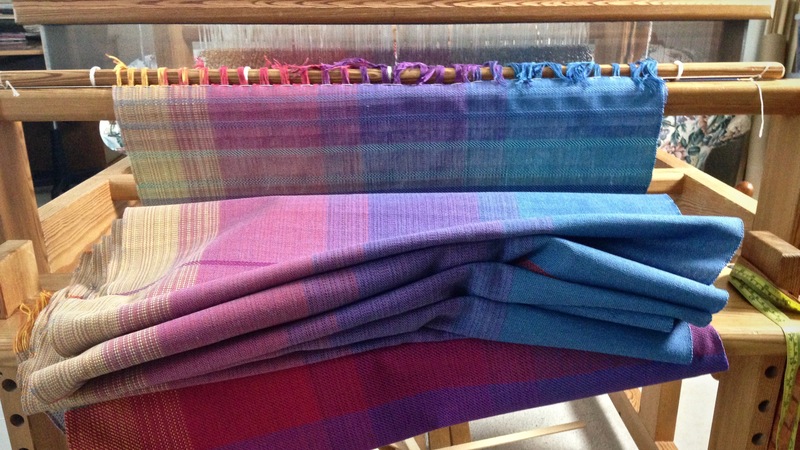 Each type of weaving produces a specific type of cloth. Very different textures. Very different purposes. Each beautiful in its own way. This reminds me of people, fashioned by the Lord. Individuals suited to specific tasks with purpose and meaning. This is our life discovery, to live the way our maker had in mind when he fashioned us with his hands. May your life be rich with meaning. I’m always so blessed by the words you have not only of weaving but of the LORD. The LORD first and then weaving and pottery are my passion. I miss human contact and go for days without companionship so when I receive e-mail from you it is truly a blessing. Tha nk you for being there, Karen. Hi Pam, Your sweet words brought tears to my eyes. I thank YOU for being there, right where you are supposed to be. 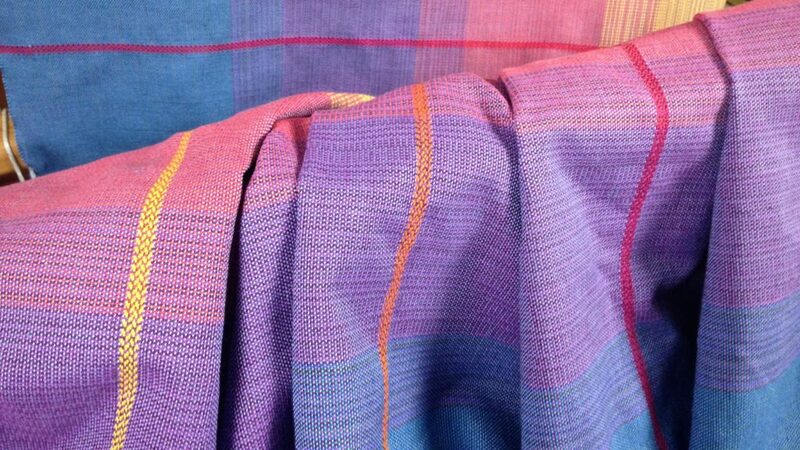 What do you weave into the fabric that will be cradling your future granddaughter? Love, and lots of it, of course. 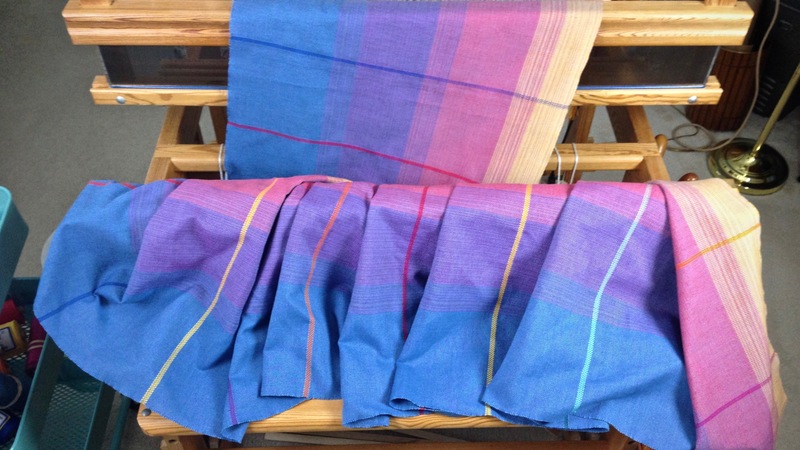 The baby wrap has been woven, and is cut from the loom! All that is left is the finishing work–examining for errors, washing and drying, and hemming. …And Melody learning how to wrap a baby wrap. Soon enough, baby Lucia will be wrapped in this love-made piece of cloth. May your loved ones enjoy your gifts of love. So beautiful. You’ve put in all the colors of light and of the rainbow, the sign of the covenant between God and Man, perfect for a wee girl whose name means Light. Joanna, Thank you for that meaningful connection between the colors and the baby’s name! Hi Kris, thank you for being a part of this journey with me. What simply perfect light and love filled baby wrap. Beautiful! Hi Martha, I appreciate your sweet thoughts! So beautiful. You have an amazing eye for color. You used color to made a very simple weave structure into something that is visually complex and eye catching. Beachweaver, It makes me very happy to have friends like you joining me in this journey! Thank you for the compliments. 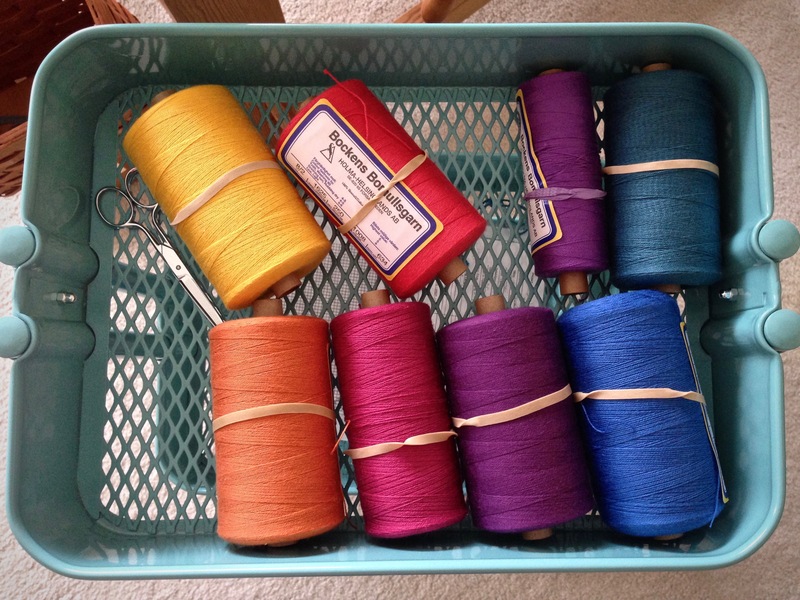 I think working with color may be my main incentive for weaving. It’s invigorating to put colors together and watch them co-mingle into something visually interesting. I am already a quarter of the way on this baby wrap. 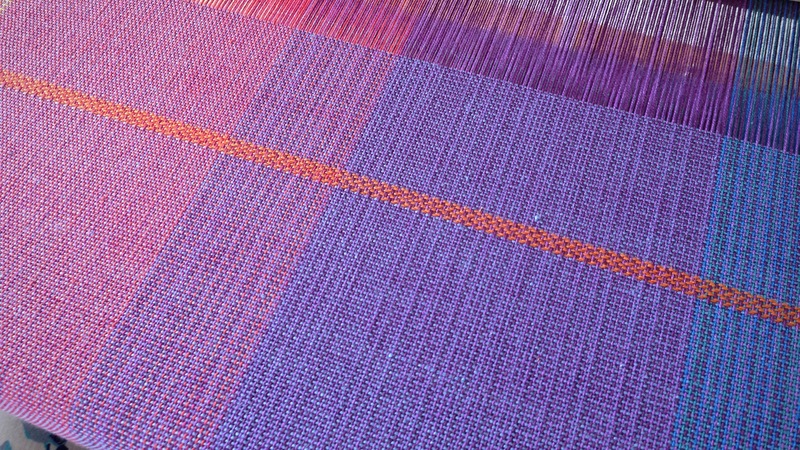 Simple plain weave with one shuttle is fast and uncomplicated, making this the perfect setting to improve weaving technique. Surely, I can gain efficiency by examining some of my practices. Twill tape has marks that show 1/4, Mid (1/2), and 3/4 of the length of woven baby wrap. The first quarter used about seven full quills of light blue weft. Under scrutiny, I see that I am not consistent in how I catch the shuttle. It makes a difference where I make contact with the shuttle as it glides into my hand. I often have to reposition the shuttle in my hand to prepare it for the return throw. That’s not very efficient. Solution? Look at the hand that is catching the shuttle. All I have to do is turn my head to look, and the hand does the job. It’s amazing how that works. It pays to pay attention. Beginning sample meets the cloth beam. 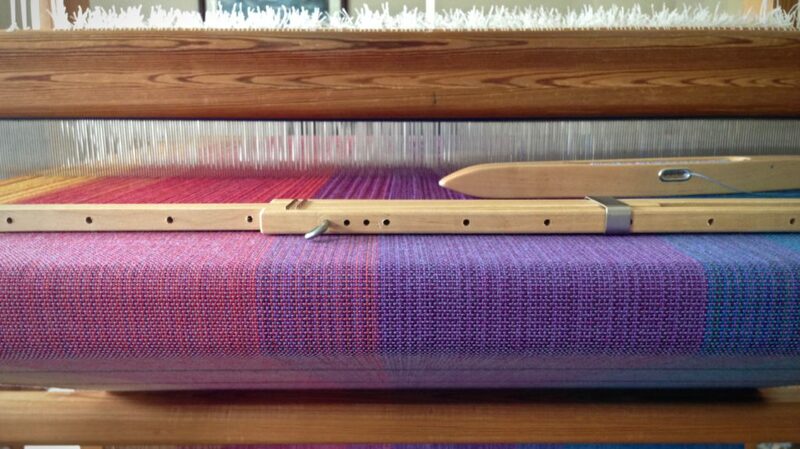 View is from the front of the loom, looking under the breast beam. Following Jesus can be compared to finding a breakthrough in weaving technique. It’s more than just meeting him, and trying to go the right way. 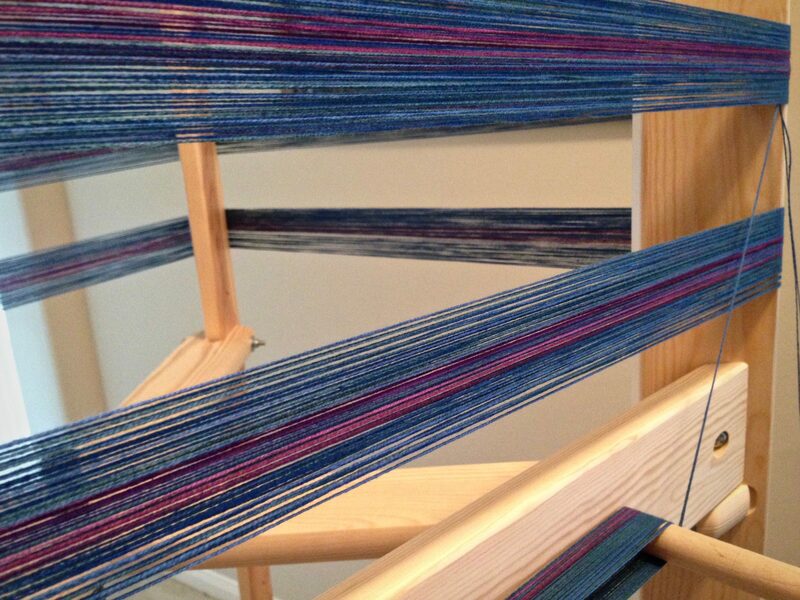 That is weaving by habit, doing it like I’ve always done it. Jesus gives all to those who give him all. Breakthrough comes when I give up my habits to find a better way–his way. May your eyes help your hands. 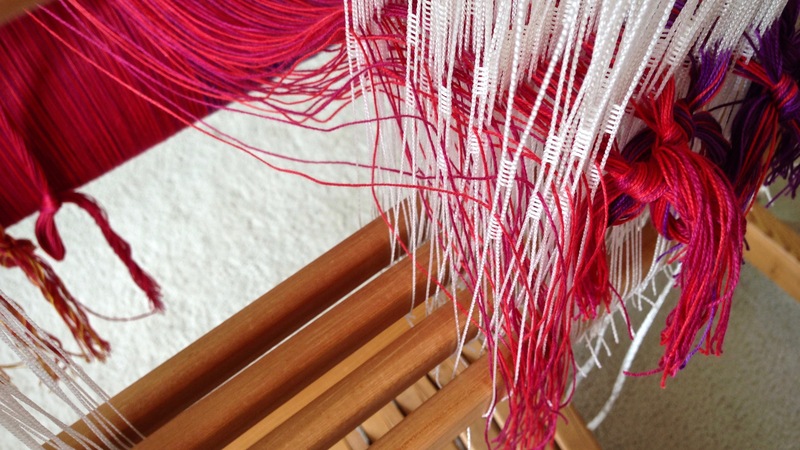 You explain so nicely the thought processes we(I) have when weaving – how to do it better, more consistently and how will this piece end up. That is the buzz that keeps us weaving again and again. Hi Kerry, I think you’re right! The analyzing and problem solving is a big factor in loving what we do. I’m loving your blog and your whispers of Jesus. Hi Randi, I’m really happy to hear that! Thanks for the reminder to use twill tape for measuring the total length of a project! 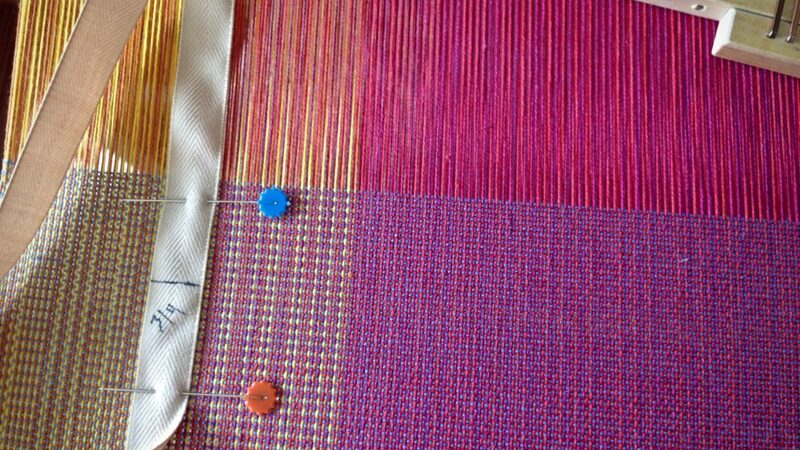 I’m ready to begin weaving a couple of table runners and had forgotten to “use the tape”. 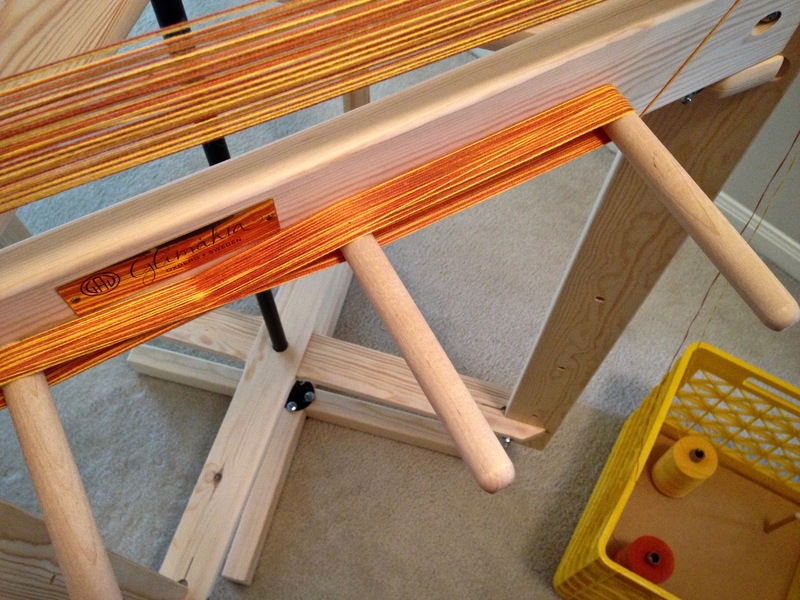 I’m changing treadling during this project and will add notes to the tape to remind myself of when those changes occur. You’ve saved me lots of time and measuring headaches with your post. Hi Ruth, Oh good! I’m so glad this served as a reminder for you. Using the tape to make notes of treadling changes is a great idea. I’ve done that before, but I don’t always think of it. So you’ve given me a reminder, too! 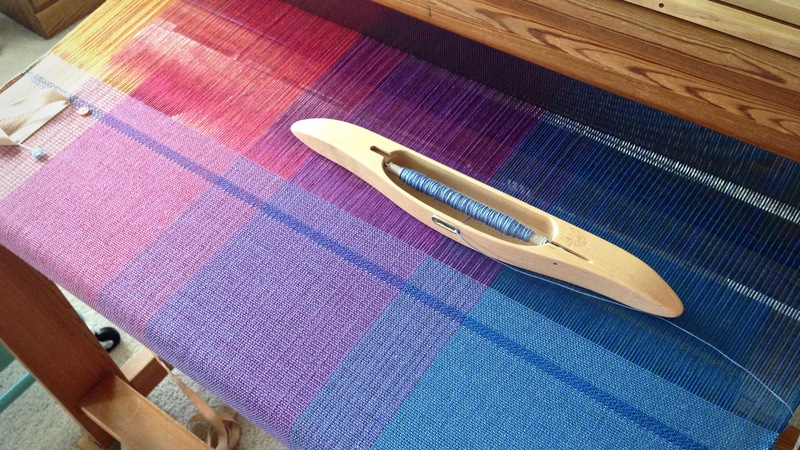 I love hearing what other people are weaving. I’m sure your table runners will be beautiful! I love the twill tape for measuring! 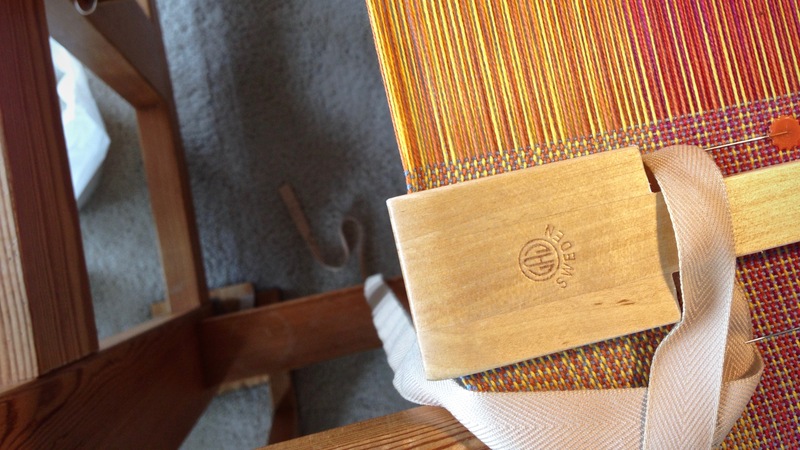 I have a variety of ways that I measure as I weave, but none are particulalry good. I have twill tape, which I use to bind hooked rugs and will make a tape for my next project. The colors of your wrap are gorgeous! Hi Debbie, I used to use grosgrain ribbon for measuring, but I like twill tape better. It’s soft, easy to pin, easy to mark, and doesn’t stretch. Thanks for the compliment about the colors! 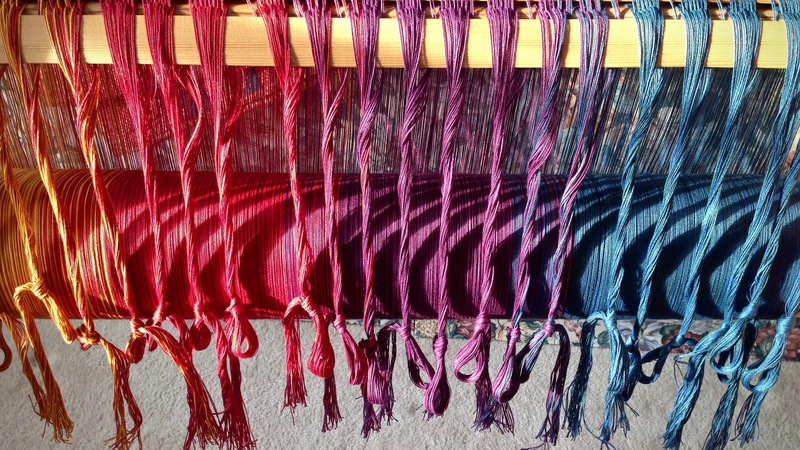 I’m energized by pretty colors, so this has been happy weaving for me. Karen: God wants us to spread our wings and try new things. I’m going to be the devil. 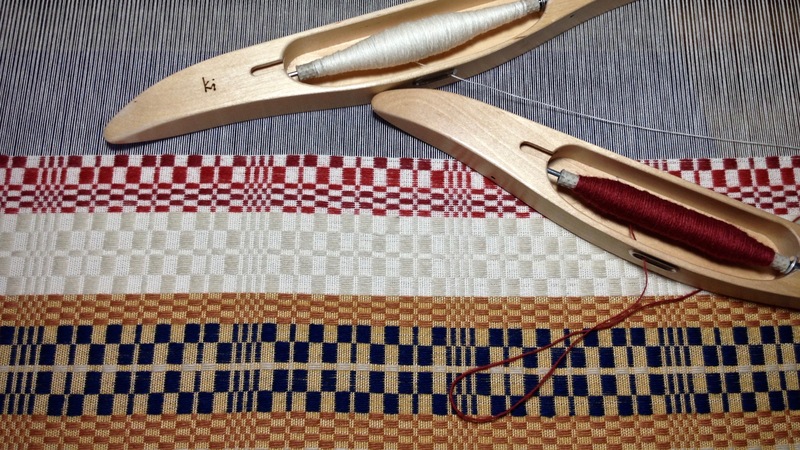 Get rid of the template, think about the music of the weaving, and try new materials. Music :Open shed 1,3 throw from R (I put my index finger on the tip of the shuttle) by flicking the wrist. catch on L(put the shuttle on the woven cloth if using two shuttles), with R hand I give a little tug to the R side ..using R hand. Open the next shed (2,4) throw from L to right, catch, place on cloth, tug L,…….. Some times by trying a new method one can find freedom, ,joy, and more time to .think..
Hi Linda, I love your eagerness to help. You give great instructions, worth trying. I agree with you that it’s good to try new things and new methods. I do like using a temple. It’s a tool I’m not likely to give up. I can let my mind wander for this part. 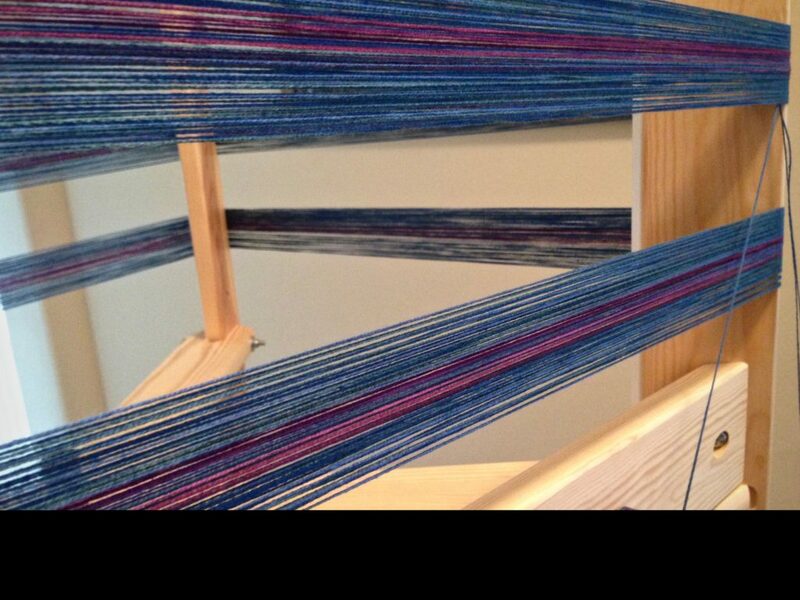 I am threading 664 warp ends in a straight draw, one warp end at a time (1-2-3-4). This is repetitive and easy. Relaxing. Of course, I have safeguards to prevent mind-wandering errors. First, I count the ends into threading groups before I start threading. 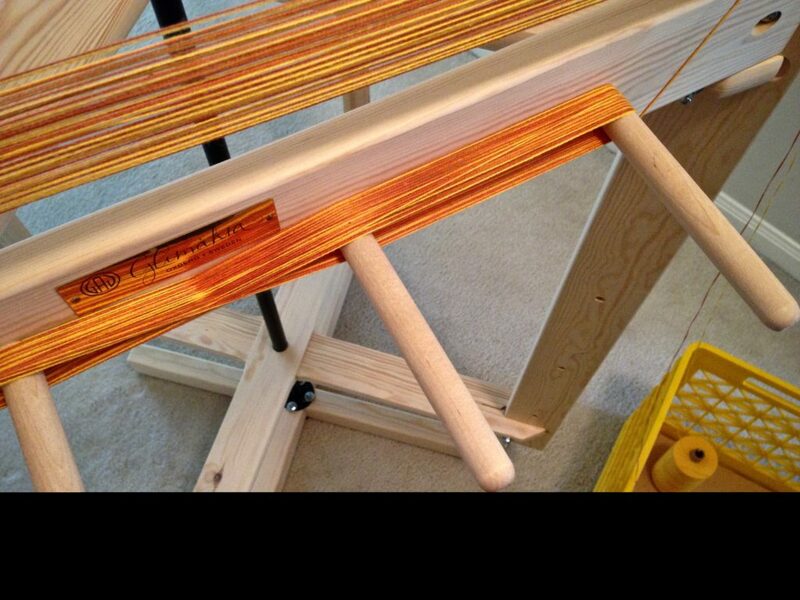 Second, I double-check each threaded group of heddles, one warp end at a time. 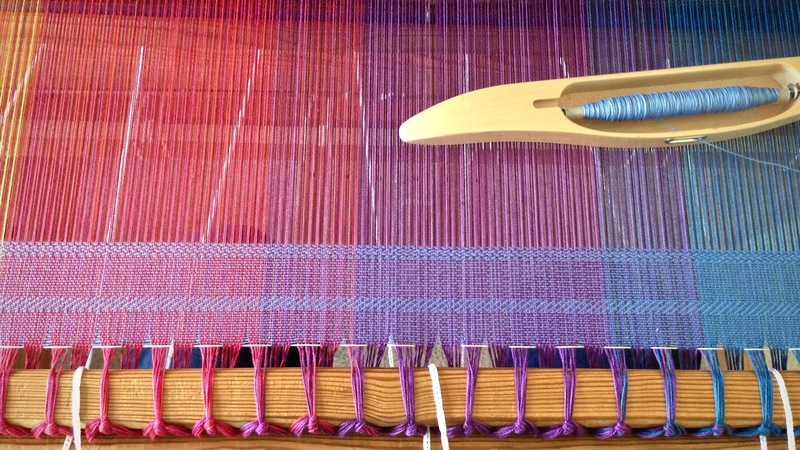 Two shades of blue are mixed with two shades of purple for transition between the blue and purple wide stripes in the warp. In quiet moments like this, my mind drifts over recent events, and ponders plans for the near and distant future. I think about friends and family–dear ones going through struggles. I remember things I’m thankful for, and who I’m thankful to. I often wish threading could go on a little longer. I like to linger there. Groups of 32 warp ends are tied into slip knots at the back beam. Each group is threaded and then checked for accuracy before tying the threaded ends into a slip knot. 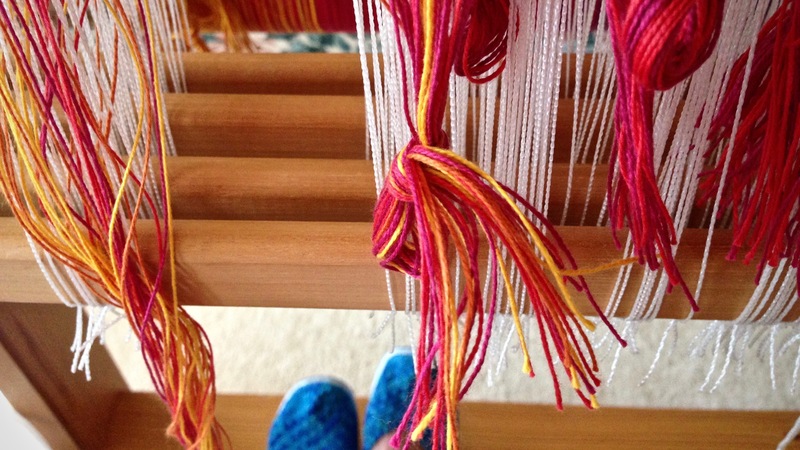 Sitting in my “playhouse” in the loom, threading from right to left, I slow down near the end so I can linger a while longer. The wondrous thing is that I can turn all these thoughts into prayers. The Lord hears us when we pray. The Lord hears the sound of your voice. In our quiet moments we have the sweet assurance that when we call upon the Lord, he bends down and listens. Instead of wishful thinking or fruitless worrying, prayer turns thoughts into faith. May you linger in quiet moments. Weaving a baby wrap is something I have been interested in doing. I am pleased, therefore, that my daughter wants to try babywearing. 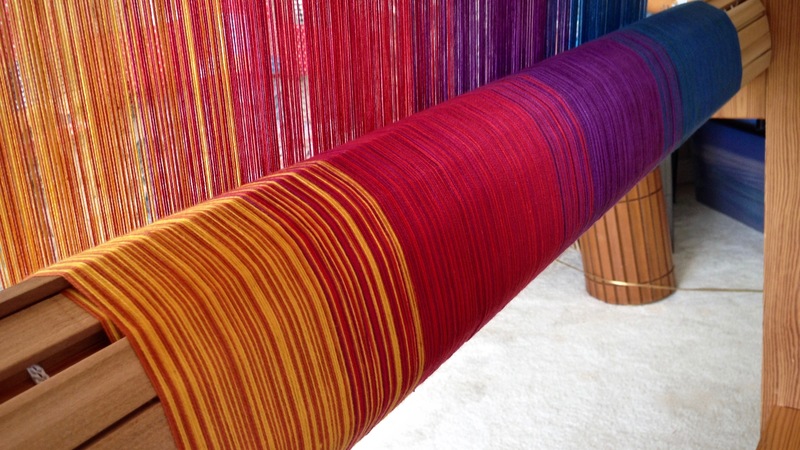 It’s the perfect excuse for me to put a colorful warp on the loom–a warp with wide stripes of blended colors. After research and careful planning, I am ready to start. Baby Lu will be here before we know it! 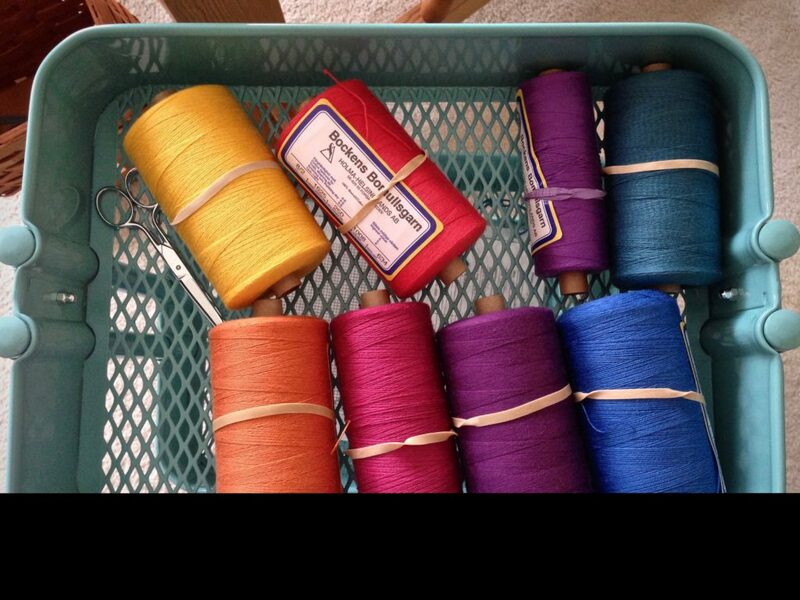 New tubes of 8/2 cotton thread combine with colors I already had on my shelves. 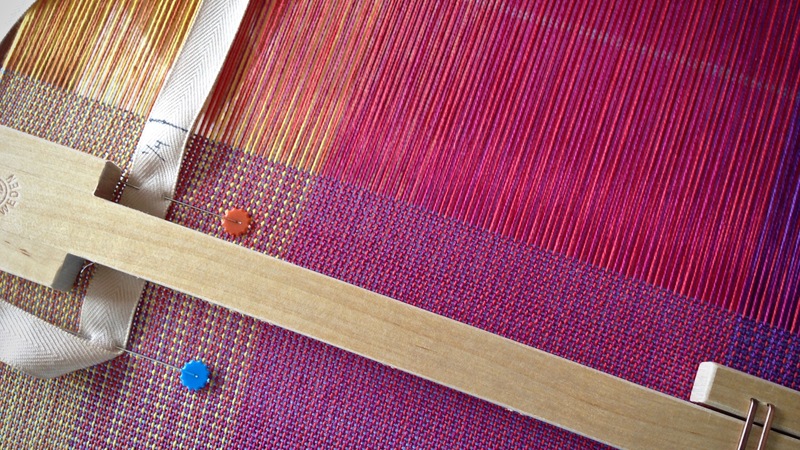 It is exciting to weave something on purpose to give to someone you love. 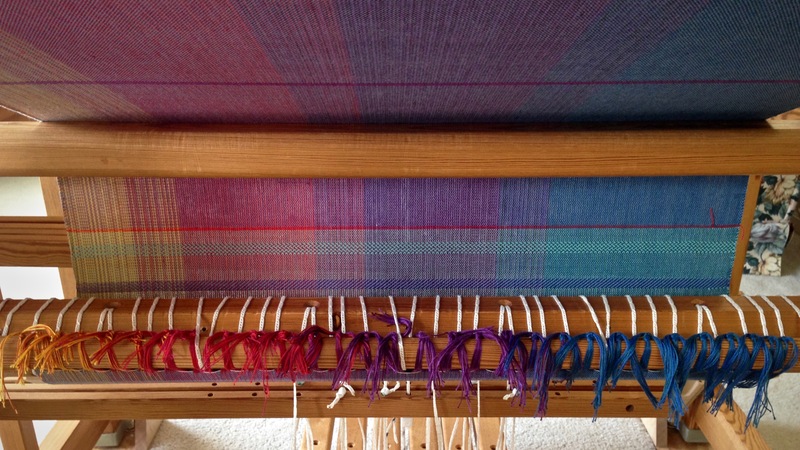 The whole process has meaning–from planning, to dressing the loom, to throwing the shuttle. You hope it turns out as you envision, or better. Making something to give is the best kind of making. The thought you put into it shows up as a gift of love. 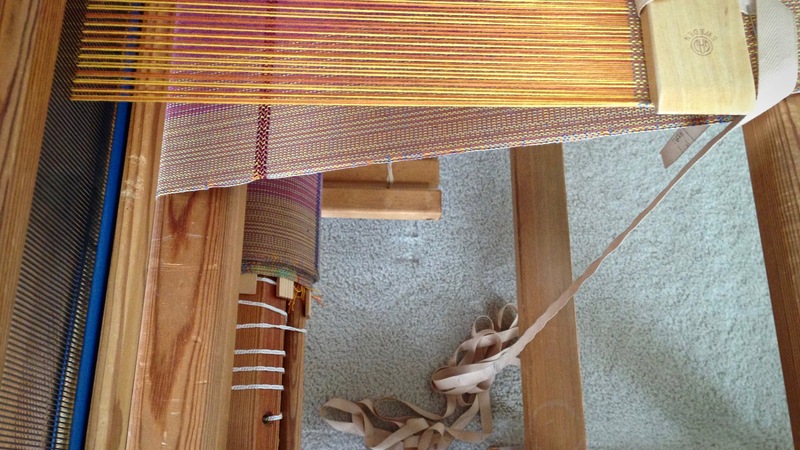 Cheerful start to the warp with “Pumpkin” and “Sunshine” alternating threads. 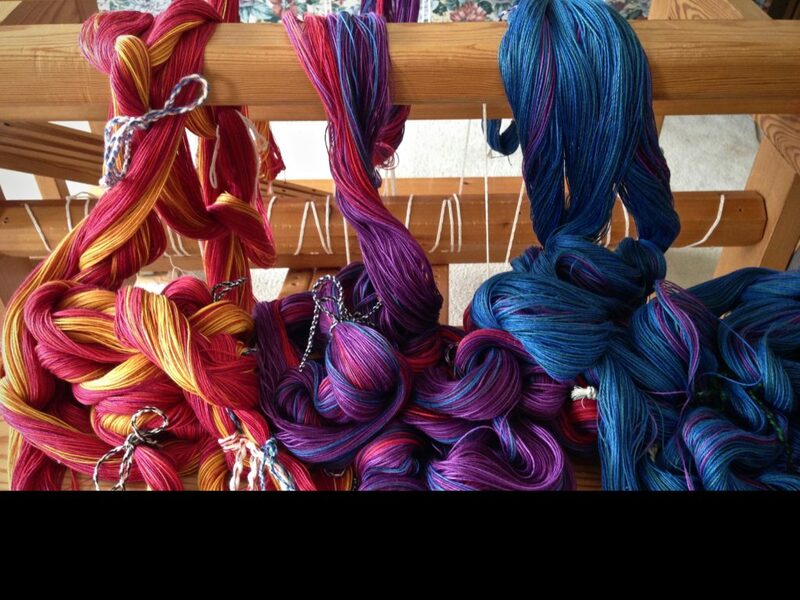 Second bout adds in “Plum” and “Mulberry” threads. “Sapphire” and “Teal” threads make up most of the third bout. Our words can be thoughtful gifts, as well. It takes thought to speak sentences and paragraphs, and conversations, that bless and enrich. Our considerate words give our recipient the means for wrapping someone else with love. Words can heal. These are the words to speak, words that give life. Weave comfort and encouragement into the things you say, touching others with kindness. Let the little ones be wrapped in their mother’s love. And let the rest of us practice sweet thoughtfulness day after day. 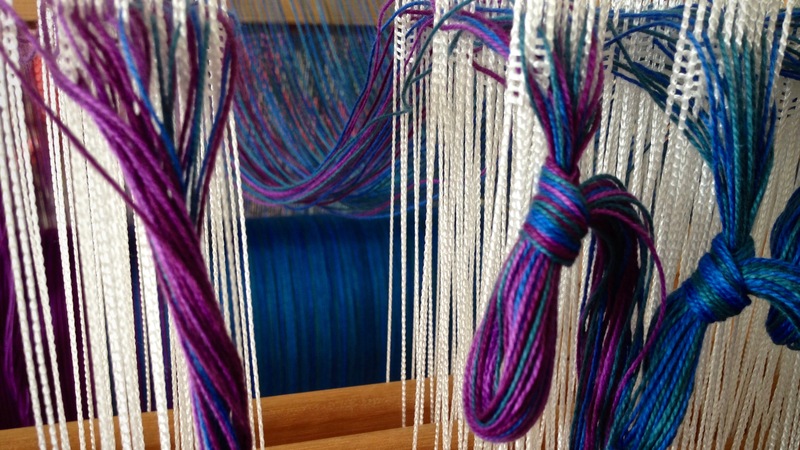 Dividing the warp into three bouts helps distribute the threads for even tension during beaming. May your words be thoughtful gifts from your heart. Your colors are so beautiful! 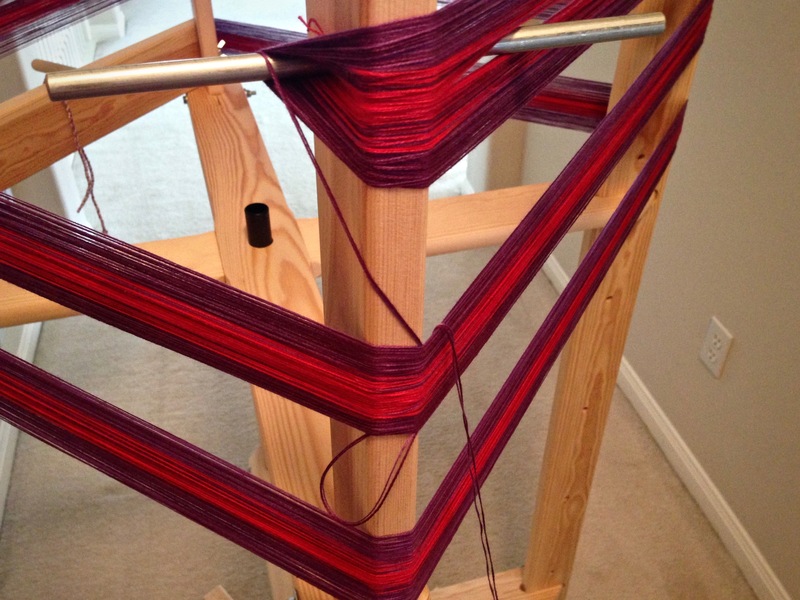 I can’t wait to see it take shape on your loom. Are you working from a draft in a book or magazine or have you created your own? I’ve wanted to make a baby wrap, but haven’t stepped up to it yet. I am looking forward to seeing what you come up with. 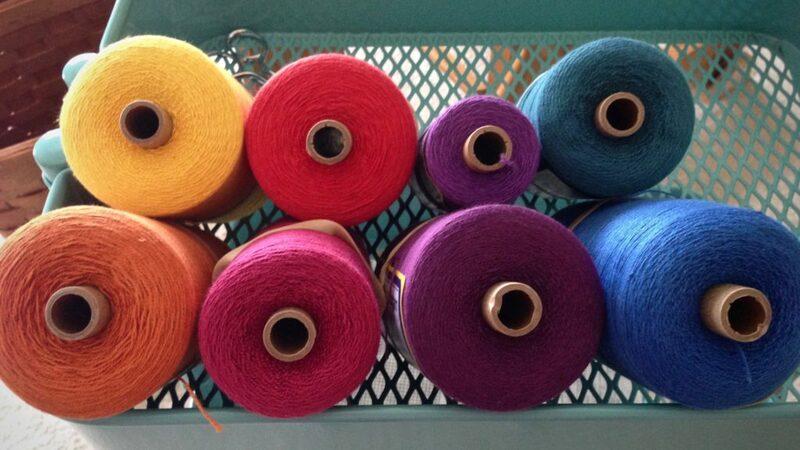 Hi Beachweaver, the colors are exhilarating to work with! I created my own draft for this after studying several others. I have the “Baby Wrap EBook” by Handwoven from Weaving Today. And the Väv magazine issue that covered baby wraps. Searching “woven wraps” in Google and on Pinterest gave even more ideas. I’m new to this baby-wrap weaving, so maybe you can learn from my mistakes as we go along. Ha! I have the Handwoven ebook on Baby Wraps. I doubt you’ll make many mistakes (certainly not as many as I do!) but I will happily learn from watching your project develop. 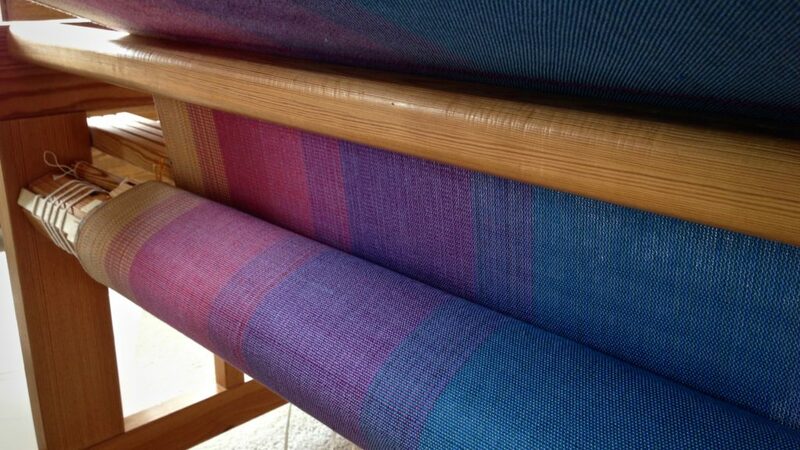 I can’t wait to see it take shape on the loom. I love your colors! 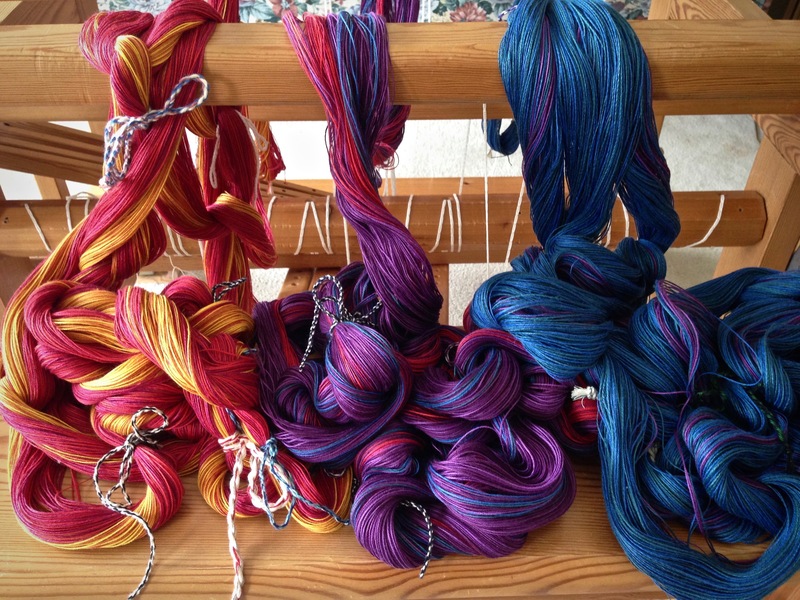 Any chance you would share the details of your colors for warping. Thanks for considering my request! I’ll be glad to share details about the colors. I’ll send you an email with the information.